Length of sleeve from underarm – 6 ins. To get these measurements it is absolutely necessary to work at a tension to produce 8 stitches to the inch in width, measured over stocking stitch. 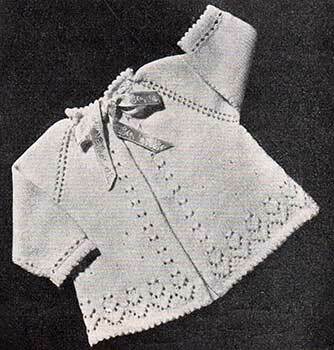 The Front, Back and Sleeves are knitted in one piece up to end of yoke, the Coat being commenced at the neck edge. 2nd row: K1, P to last st, K1. 3rd row: K1, * yo, K2tog, rep from * to end. 7th row: Make hem by knitting tog one st from needle and one loop from cast on edge all across row. In next row: (On which holes for ribbon are worked), K1, yo, K2tog, rep from to end. In next row: K Cast on 3 sts at end of row for turned in front edge. In next row: K Cast on 3 sts at end of row. 1st row: K20, yo, K1, yo, K10, yo, K1, yo, K30, yo, K1, yo, K10, yo, K1, yo, K20. 2nd and alt rows: K1, P to last st, K1. 3rd row: (On which first holes at front borders are worked), K8, yo, sl 1, K2tog, psso, yo, K10, yo, K1, yo, K12, yo, K1, yo, K32, yo, K1, yo, K12, yo, K1, yo, K10, yo, sl 1, K2tog, psso, yo, K8. 5th row: K22, yo, K1, yo, K14, yo, K1, yo, K34, yo, K1, yo, K14, yo, K1, yo, K22. 7th row: K23, yo, K1, yo, K16, yo, K1, yo, K36, yo, K1, yo, K16, yo, K1, yo, K23. 9th row: (On which second holes at front borders are worked), K8, yo, sl 1, K2tog, psso, yo, K13, yo, K1, yo, K18, yo, K1, yo, K38, yo, K1, yo, K18, yo, K1, yo, K13, yo, sl 1, K2tog, psso, yo, K8. In next row: K1, P to last st, K1. Still working holes at front border as before, and knitting 1 st at both ends of every row throughout, work 6 rows in Stocking Stitch (1 row K, 1 row P). In next row: K8, yo, sl 1, K2tog, psso, yo, K6, (inc in next st, K11) twice. (43 sts). Keeping border holes correct, work 11 rows in Stocking Stitch. 1st row: K5, [K3, * yo, sl 1, K2tog, psso, yo, K5, rep from * to last 6sts, yo, sl 1, K2tog, psso, yo, K3]. 2nd and every alt row: K1, P to last st, K1 . 5th row: K5, [K2, * yo, sl 1, K1, psso, K1, K2tog, yo, K3, rep from * to last 7 sts, yo, sl 1, K1, psso, K1, K2tog, yo, K2]. 9th row: K5, [K1, * yo, sl 1, K1, psso, K3, K2tog, yo, K1 , rep from* to end]. 11th row: As 5th row. 14th row: K1, P to last st, K1. In next row: Cast off 3 sts, K to end. In next row: K3, *yo, K2tog, rep from * to end. In next row: K54, turn. ** In next row: K1, P to last st, K1. Work 8 rows in Stocking Stitch. Dec. 1 st at both ends of next and every following 6th row, until 44 sts remain. Continue on these sts, until work measures 5 ins. from where sts were divided at yoke, finishing at end of a K row. In next row: K1, * yo, K2tog, rep from * to end. In next row: K1, (inc in next st, K4) five times, inc in next st, K2. (35 sts). Work 11 rows in Stocking Stitch. In next row: K12, (inc in next st, K12) four times, inc in next st, K to end. (81 sts). Continue on these sts, until work measures same as Front up to commencement of Lace Border, finishing at end of a P row. Rejoin wool to sts on needle, K54, turn. Complete to match first Sleeve, working from ** to end. Rejoin wool to remaining 41 sts. Keeping border holes correct, work 8 rows in Stocking Stitch. In next row: (K11, inc in next st ) twice, K6, yo, sl 1, K2tog, psso, yo, K8, (43 sts). In next row: (K8, inc in next st) three times, K5, yo, sl 1, K2tog, psso, yo, K8. (46 sts). 1st row: K3, * yo, sl 1, K2tog, psso, yo, K5, rep from to last 11 sts, yo, sl 1, K2tog, psso, yo, K8. In next row: Cast off 3 sts at beg of next row, P to last st, K1. Work 2 rows in Stocking Stitch. Cast off loosely. Fold back 3 sts at front edges and slip-stitch on wrong side. Fold back cast off edges of Fronts, Back and Sleeves at 1st row of holes and slip-stitch on wrong side of work, thus forming Picot hem. Thread ribbon through holes at neck. Finally, press all seams.